Nearly two years ago, St. Patrick’s Cathedral removed the scaffolding that had been shrouding its neo-Gothic facade to reveal a restored landmark. The work was part of a larger four-year $177 million restoration and conservation that’s also included an interior overhaul, renovation of the garden, and a new heating and cooling system. This last component is also now complete, as The Architect’s Newspaper reports that the Cathedral has activated their new, state-of-the-art geothermal plant, just in time to warm things up for St. Patrick’s Day. The system will cut the building’s energy consumption by more than 30 percent and reduce CO2 emissions by roughly 94,000 kilograms. Unlike most geothermal systems, it’s able to heat and cool both the 76,000-square-foot Cathedral and its surrounding buildings simultaneously. 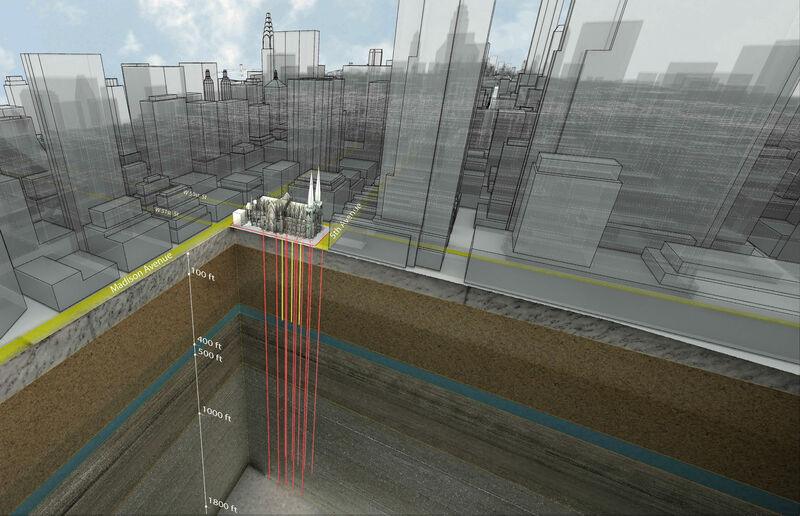 In order to produce enough energy, the design and construction team–that included Murphy, Burnham, & Buttrick, Landmark Facilities Group, PW Grossner, Silman, and Langan Engineering, and Structure Tone of New York–drilled ten wells at 2,200 feet deep on the north and south edges (along 50th and 51st Streets) of the property. These then distribute heat to a Dedicated Heat Recovery Chiller, in turn producing up to 2.9 million BTUs of air conditioning or 3.2 million BTUs of heat per hour. This was all done while adhering to strict preservation and zoning codes. St. Patrick’s hopes this will inspire other religious institutions around the globe. “A consistent ethic of life does not compartmentalize these issues. It prioritizes life and the preservation of life at every level. One of the most basic ways in which we are called to do so is through responsible stewardship of our natural resources,” said cathedral Rector Monsignor Robert T. Richie. St. Patrick’s Cathedral Reveals $177M Restoration, Now What? I wonder how many homes of poor Catholics that princely sum of money could have heated this winter? Oh yes, I forget, we must concentrate on that other-worldly pie in the sky instead. Bon petite.